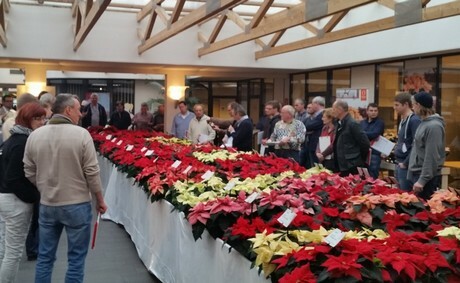 Each year, Dümmen Orange holds its Poinsettia Seminar in Rheinberg, Germany to kick off the new sales season with German growers. This year the seminar was held on the 11th of January. Together with customers and business partners, Dümmen Orange evaluated the past year and looked ahead to the new year, while collecting feedback. This year Dümmen Orange also gave its customers a sneak peek ahead of IPM 2019 by presenting their sustainably grown poinsettias for the European market. This is the next new crop that they grow according to the GreenGuard protocol (‘Minimal Chemicals, Maximum Quality’), following last year’s first GreenGuard crop, pot chrysanthemums. GreenGuard follows the Integrated Pest Management (IPM) principles. IPM is an ecosystem-based strategy that focuses on long-term prevention of pests and diseases through a combination of techniques such as beneficial organisms, growing resilient crops, intensive monitoring, hygiene protocols and bio-pesticides application. GreenGuard pest control materials are selected and applied in a manner that minimizes risks to human health, beneficial and non-target organisms, and the environment. Furthermore recent researches confirm that pests populations and diseases are getting more resistant towards chemicals. Because of the new GreenGuard poinsettias, Dümmen Orange also welcomed two acknowledged experts in their field of expertise as guest speakers to the seminar, Rainer Wilke of Pflanzenschutzdienst NRW and Hans Walkenbach of Koppert Biological Systems. Rainer Wilke shared his views and knowledge on the possibilities and limitations of fighting white fly via a biological approach. Based on his experience and work, Hans Walkenbach discussed the possibilities of using beneficials against white fly.